Part 2 of the CPDD Annual Meeting Public Policy Forum featured Angela Hawken, Ph.D., Associate Professor of Public Policy at the Pepperdine University School of Public Policy. 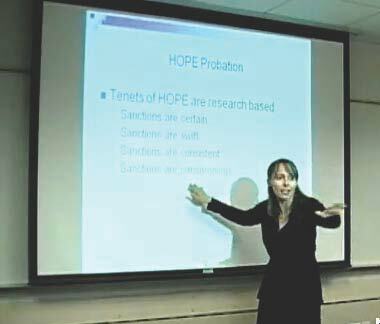 Dr. Hawken spoke about the Project HOPE (Hawaii's Opportunity Probation with Enforcement) initiative, an alternative drug offender monitoring and punishment system, which based on early data appears to be superior in a number of ways to Hawaii’s standard management of drug offenders. Standard management of drug offenders typically involves substantial delays between an arrest for a drug offense and any punishment; offenders often will have been arrested multiple times before they are incarcerated. Thus, incarceration is not much of a threat to most offenders. And, when incarceration occurs, sentences often are long, which can sever any roots an offender may have to their family, their community, and their job. This of course makes it harder for parolees to reintegrate into society after release, which may increase recidivism. By contrast, Project HOPE is based on a behavioral triage model involving intensive randomized urine screening (6 times per month) that rewards offenders for good behavior (timely and clean urine tests) and immediately punishes them (incarceration) for using drugs or for noncompliance. Thus, offenders have an immediate stimulus to shape their behavior. Punishments while swift are less draconian than in the standard system (2 days in jail for an initial offense). This minimally taxes the prison system and minimally displaces offenders from their families and jobs, which ends up being much less costly and debilitating to all. A randomized controlled trial (N=330) comparing Project HOPE to standard management garnered remarkable results: positive urine screens were reduced by more than 70%, incarceration days were reduced by more than 48%, and more than half of the people in the HOPE arm completely stopped using drugs. These data suggest that the Project Hope strategy is an effective management model with the capacity to more effectively shape offender behavior, resulting in substantial savings in terms of treatment resources and in terms of criminal justice system costs. The behavioral triage approach currently is being assessed in other states and in juvenile offender populations to determine whether it can be widely applied. In 2009, Dr. Hawken presented a lecture at the Pepperdine University School of Public Policy in which she compared California Proposition 36 (which she characterized as a poorly implemented approach) to Project HOPE. A video of that presentation can be viewed on YouTube (4 parts, ~36 minutes).